Mr. Frugalwoods gave me a haircut last week and, as I shared on Twitter: 1) we’re still married and 2) it looks really good! I’ll admit, we were both a bit nervous and there were a few tense words, but it worked out just dandy. In other news, I’ll be nominating him for husband of the year (is that a real award? it should be) shortly. There are a number of guides out there on how to cut your hair yourself and huge props to anyone who accomplishes that feat (Simple Cheap Mom has this excellent guide for DIY haircuts). I considered cutting mine solo, but since Mr. FW was game to help me (partly because I’ve been cutting his hair for years), we decided to try it out. Hence, these steps are written with two parties in mind, but, I think you could just as easily pull the hair forward and cut it yourself. The catch it that it wouldn’t be as accurate since having a friend do it means they’ll be pulling your hair straight back from your head, which yields the straightest cut. Before we proceed, let me clarify: This is not the recipe for a perfect haircut. If you require a perfect haircut, you’ll need to go to a salon and shell out $100+. But if, like me, you’d rather save that $100 for, oh I don’t know, retiring early and pursuing your passions, then I encourage you to give this a whirl. Hair will grow back; your money won’t. That being said, I have a professional job at which I need to look presentable and, let me tell you, this haircut is absolutely good enough. Would a stylist do a better job? Heck yes, but, since we prefer to insource everything we possibly can (and hence save 71% of our incomes every year), this haircut is positively ideal for our frugal weirdo philosophy. Another factor in my decision to cut my hair at home is my journey to simplify my life and put less of an emphasis on my appearance. I realized with my clothes shopping ban that I was spending way too much time focused on what I wear and how I look. In addition to this being a colossal waste of time, I wasn’t comfortable with the vanity it implied. De-emphasizing my appearance has been beneficial for me in many ways, including that: I get ready faster, I spend less money on clothes and products, and I feel generally healthier thanks to my lack of regular make-up, nail polish, perfume, etc. All in all, its been quite liberating. It’s still a work in progress, but, I like to think that my home haircut is another step in the right direction. Can I cuts your hairs, pleeez? Ensure that the haircutter and haircuttee are both sober. Do not allow a greyhound to cut you hair, no matter how cute they look. Do not expect perfection and do not stress out. If things go really awry, please take the advice of Frugalwoods reader Tarynkay who, after very kindly giving me detailed advice on how to cut my own hair, listed the final step in the hair-cutting process as “If you hate it [the home haircut], drink a glass of wine and read something inspiring about feminism. Remember that it is winter so you can wear a lot of hats for awhile.” Sage wisdom, my friends. The haircut we achieved could best be described as soft, long layers with angles towards the chin. All credit for the angles goes to Mr. FW who figured out how to do these mid-haircut (full disclosure: one side came out a bit better than the other side). I didn’t want the blunt, straight-across look of a standard cut, so this yields a feathery, softer look. My hair is very thick, so a softer cut falls better. The professionals cut hair wet, so we decided we would too. Since my hair is ultra-thick and long, it’s a lot easier to manage when wet. 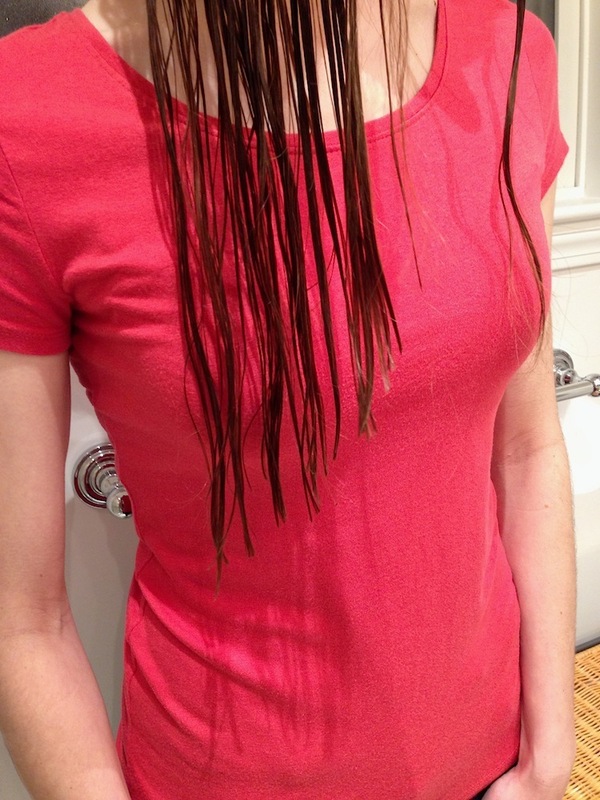 It’s vastly simpler to line hair up and find all the split ends when it’s wet. The caution here is that hair shrinks up when it dries, so be wary of taking off too much length when it’s wet. 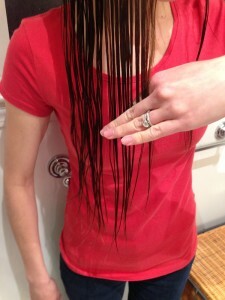 Step 2: Part hair as you normally do. This ensures that you’re cutting your hair as it normally falls. If you brush it all back to cut it, you’ll lose the natural lay of your hair. So, best to part it up. This is especially important if you’re going to angle it towards your face as we did. 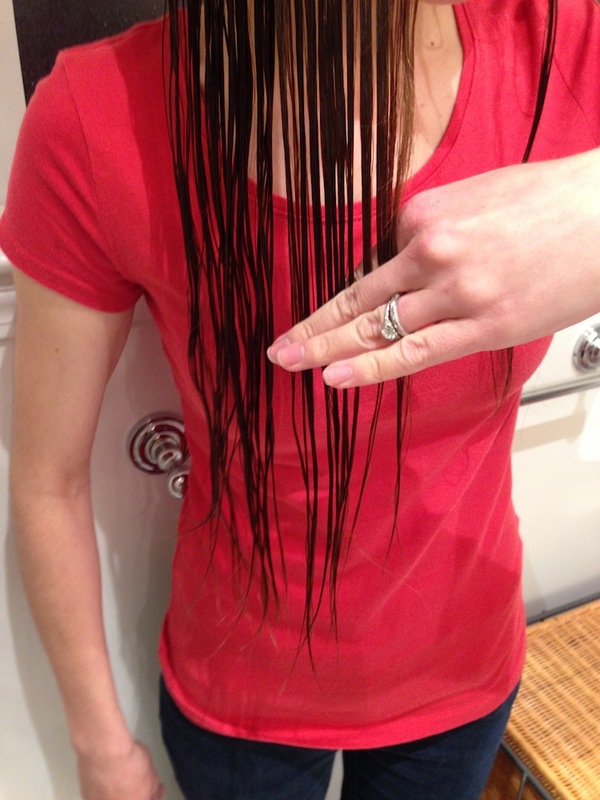 Step 3: Divide hair into 4 sections and secure with clips. Section 3: Next I took the middle hunk of hair, parting it horizontally below the ears. Section 4: The final section is the very bottom of your head–the hair should just hang straight down. Step 4: Select a small piece of section 4. Take the leftmost (or rightmost) small section of hair from section 4 and have your home hairdresser comb it straight back from your head. To clarify, we’re starting with the hair at the back, lowest part of the head. Step 5: Determine how much length to take off. Since I didn’t want to lose a lot of length and was mostly hoping to eliminate split ends, Mr. FW made the cut in line with the shortest piece of hair. 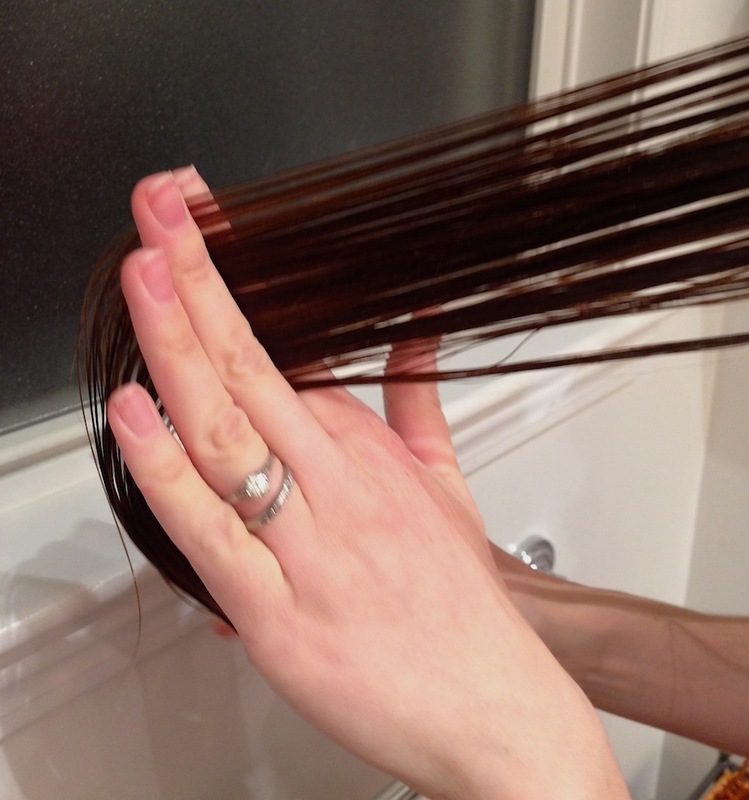 To do this, run your first two fingers through the hair until you reach the shortest strands. You could cut any length desired with this method. Step 6: Cut hair upwards in a half-moon shape. Since I didn’t want a blunt, straight-across cut, I had Mr. FW cut upwards in a semi-circle. This ensured a clean cut, but doesn’t give that overly blunt look to it. Step 7: Cut in small triangles. On the piece you just cut upwards, now take the scissors and cut in tiny triangles. This further adds to the soft, feathery look of the cut. Step 8: Repeat for the rest of section 4. Take another small piece of section 4 and repeat the process until you’ve cut all of the hair in section 4. Tip: Put the hair that has already been cut in front on your shoulders so that you don’t forget! Step 9: Clip up section 4. We’re now all done with section 4, so clip it back up to keep it out of the way. Step 10: Unclip section 3 and divide into two pieces. I had a lot of hair in section 3, so I held half of it while Mr. FW cut the other half. Section 4 is done and clipped up. I’m holding half of section 3 so Mr. FW can cut the other half. Step 11: Follow the same steps for cutting the hair. Use the same technique of combing small segments of hair straight back and then cutting upwards in a semi-circle followed by cutting in tiny triangles. Step 12: Clip up section 3. We’re now all done with section 3, so clip it back up to keep it out of the way. Step 13: Unclip section 2. This section is on the front side of the head and is the hair that’s in front of the ears. To angle it towards the chin as we did, cut from the bottom towards the chin in a diagonal line. We made the mistake of going the other direction first, and uh, it didn’t turn out quite as well… still totally fine though. At this stage, it’s crucial that you’ve parted your hair on the side that you normally do, because the angle on that side will be a bit shorter so as to frame your face. Since I part my hair on the right, the angle on the left curls just under my chin. Mr. FW first combed the hair downwards and then used his fingers as a guide to cut up towards my chin. This was one spot where it would be nearly impossible to achieve accuracy if the hair was dry. Step 14: Unclip section 1. This is the other section at the front of the head with hair in front of the ears. We followed the same angling technique for this side: cut from the bottom towards the chin in a diagonal line. Step 15: Measure length of your longest front layers. 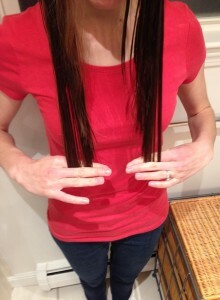 Pull downwards on your longest front layers and check that the length is even. Make adjustments as needed. Step 16: Blow dry hair. 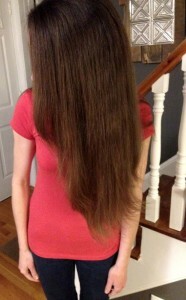 I blow dried my hair (not something I normally do) so that we could check the length. Mr. FW found a few stray hairs after it was dry, which he easily snipped off. The finished product. You can see the layers as I’ve brushed it all back here. Step 17: Luxuriate in your awesome, free hair! Having Mr. FW cut my hair at home represents one of our final frugal frontiers. Heretofore, I’d paid handsomely to have it cut at a salon, which had been my one beauty indulgence (I’ve always done everything else myself–eyebrows, nails, etc). The last time I had it cut was over a year ago and even though we can afford it, I didn’t want to waste my money on it this year. Quite simply, I’d rather save that $120 and reap the benefits of compound interest over time. Compound interest, by the way, is a magical unicorn of awesomeness, in case you hadn’t heard. As for me and my hair, we’re going with the magical unicorn. Have you ever cut your own hair? Are you motivated to try it now? What’s the worst that can happen, right ;)?! My wife cuts mine. $25 from woot for a Wahl kit and never looked back. About 2 years now. Blade maintenance is the easiest and most important part. They give you the oil for a reason. I don’t.know why it felt so intimidating to oil the blades for the first time. I wouldn’t be able to tell that your husband cut it! I think my wife likes to get out of the house for a peaceful afternoon. She does go to the local school which is a.lot cheaper but takes a bit longer. Last time I went to a salon was about a year ago. Your hair cut looks amazing, I love it. Looks great! Mr. Frugalwoods is a brave man. Looks good! I’ve been cutting my hair for over a decade, it’s way easier than people think! Although… Last week I tried to trim up my 18month olds bangs since they were getting in her eyes…the next day at school the teacher asked me if she or her brother had gotten the scissors…. And I had to admit it was me! Wiggling toddlers are difficult to cut hair on! Oh man now that I think about it I’ve been cutting my own hair for almost a decade as well. ( oh man I’m getting old) lol. I’ve always been really free and carefree about my hair. As you pointed out it grows back. Plus my mom use to cut our hair and we use to turn around and cut hers. I’ve had lots of practice. People who have cut my hair include, mother sister husband brother and probably my son. Haha–wiggling would definitely make the entire process much more difficult. That’s awesome that you’ve been cutting your own hair for so long. I’m super impressed! You’re brave! My wife wouldn’t let me near her hair with scissors. She goes to the local beauty school from time to time–they charge $7 or $8 for a trainee to cut hair under the supervision of someone with experience. It took a couple hours, but turned out well. I think Mr. FW is the brave one here ;). He was wielding the scissors after all! $7-$8 is a great price for a haircut–what a good find! I only cut mine every 2-3 years since when I do it’s to donate 10+ inches to locks of love. So when it does get cut that irregularly I don’t mind going to a salon and shelling out $50 for a decent cut to reshape it after losing that much length. That totally makes sense. And, what a wonderful thing to donate. I’ve been wanting to cut my own hair for a while now. This seals the deal! Bring on the weekend!! I don’t think either one of us would let the other cut their hair. I will gladly pay $15 for a nice cut! I have a certain layered cut I like and I doubt my husband could pull it off. I certainly don’t want to be his guinea pig. Ha! Cool! Looks good. Good thing it’s long. As complicated as this looks to me, it’s probably much easier than styling something short. You sure do have a lot of hair left, though. If I was Mr. Frugalwoods I’d be begging, Please let me take off another 6 inches so I don’t have to do this again for a long time! Margie goes once a year for a haircut for $40 or $50. I haven’t gotten mine cut professionally for the last ten years, when we bought the above-mentioned Wahl. We definitely felt that we had a pretty good buffer for emergencies with the length of my hair :). Mr. FW and I both like it long, so I’ll probably keep it this long for at least a little while longer. That Wahl clippers set is just the best! 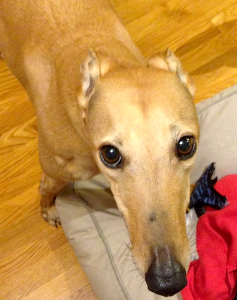 Frugal Hound is highly suspicious of the sound though, which is pretty funny. Wow!!! It looks great, but I have to confess that it seems like a lot of steps and FB Hubby has ADD so I am not sure he could follow through on this. I may think about getting my sister to cut my hair, though, and use this post for our reference. It is a lot of steps, but it actually didn’t take all that long (though of course it did take us awhile since we were trying to photograph it, which was pretty awkward in our tiny bathroom 🙂 ). Let me know if you have your sister do it, I’d love to hear how it turns out! Your hair looks great, Mrs. FW. I took the jump and started cutting my own hair a year and a half ago…never looked back! My method is super-duper simple so Shannon shouldn’t need her sister! Simply pull your hair forward into a unicorn ponytail that sits right at the hairline across your forehead. Draw the holder out to the place you want to cut and SNIP! That gives me my layers. Then I split the lower half of the back (your section #4) and bring it in front and cut much like you do but in just two sections. Sounds like a pretty good DIY method! I’m impressed! Wow. I cut Mrs. Root of Good’s hair, but it’s a straight shot across the back and I normally start off cutting and inch or two then eat up another inch or two trying to get it straight. It only takes 3-4 minutes plus a few minutes of cleaning up. Your method is way more advanced but probably a lot closer to those $120 haircuts at the salon. Looks great! I think the last (and only?) time we have ever paid for a haircut was once while I was in law school and splurged on a $6 Supercuts trim so I could bag a sweet $100k/yr job (I didn’t end up practicing law, but that’s another story). I like that you “splurged” on Supercuts. Spoken like a true frugal maven. I can’t blame him. Straight across is quick, efficient and near-error proof. Hmmm, good question on longer vs. shorter… I do find my long hair to be easy for all the reasons you mention. 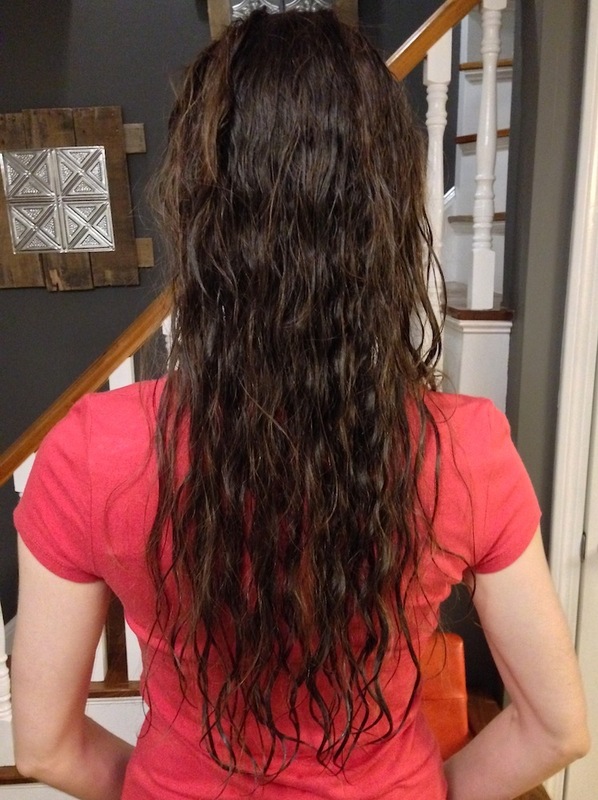 I only wash it twice a week because I can put it up in a bun or braid on the final two days before each wash.
And, I definitely felt like we had a pretty big margin of error in the haircut with how long my hair is–even if the cut was drastically bad, we would’ve had plenty of hair with which to fix it :). Not quite the case with shorter hair I suppose. But I’ve never had really short hair, so I can’t speak from experience about the other side of things :). Now I’ll be kept awake by this pressing question! Your hair looks awesome and you guys make it look so easy! I’m glad to hear you say how much better you feel without wearing all the makeup and perfume. I feel the same way! I am looking forward to my new homestead this next year with my new hubby. It is remote, but we will gain so much in God’s gifts and separating ourselves from the material things in the world. Land with fruits, vegetables, berries and wild game to supplement our domesticated livestock. Lord, I Am Ready Now. 🙂 And yes, I get free trims every few months. I am in this world not of it. My treat is buying ball jars and of course the new land and house. We don’t need frivilous things, just honest fun being on the land. Praise be to My Lord and Savior Jesus Christ. What’s the worst that could happen ;)? “Hair will grow back; your money won’t.” If that isn’t wisdom to live by I don’t know what is! Great DIY project; glad it was a success! Thanks! Glad you liked it :). And I’m happy it was a success too! That’s wonderful that your husband cuts your hair too. It’s awesome to both save the money and know that we can do these things ourselves! Ha ha, LOVED the sobriety disclaimer! 🙂 Seriously though, great step by step guide! As you well know, Mrs. FR cuts my hair and has since we got married. But, my hair is very much like Mr. FW which means pretty much anyone can do it. Mrs. FR is a bit more hesitant with her hair though and I can understand. She has relatively short hair so I’d hate to do something to it. I can’t complain too much as the $9 cut she’s getting at the beauty school is far better than what she had been paying before. The cut turned out great! I’m glad you documented your first cut. Mr. Frugalwoods did an awesome job to figure out the technical way to do all those steps properly. I love that there were some heated words, the passion shines through your locks! Wow you guys got fancy with this — it looks great! (Also YES to caring less about appearances, and reading inspiring feminists when you get too caught up in it, I love that strategy). 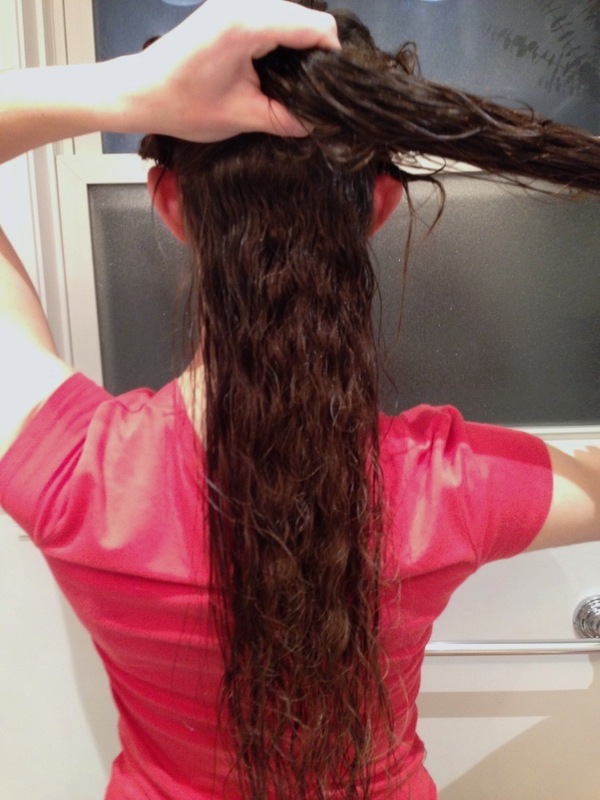 I cut my own long hair for a year using the super simple pontail method, although that definitely let split ends develop in my shorter layers. I just recently donated my hair (with the help of a salon, that was too advanced for me to try!) and am hoping to keep cutting it myself, but now its too short for a ponytail! Worst case scenario though I guess I can always run to the salon if I ruin it. Thanks! I’m really trying to focus less on my appearance in all respects, so this was a great way to reaffirm that conviction. That was very kind of you to donate your hair–someone will be so grateful to you. 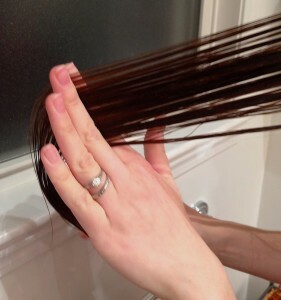 I’m sure there are ways to cut short hair yourself, but I’m not sure what they are… Have you heard of the Crea Clip? That seems like it would probably work on shorter hair. Yes I actually just made a mental note this morning to check out the Crea Clip and if it would work! Oh good! Let me know if you end up trying it. I’m curious about it for the future in case I ever decide I want short hair. My friend at work got one of those flobees to cut her hair. I have not tried that but it might be worth checking into. I’ve come across a few good videos for self cutting pixie styles. I can post links if anyone is interested. If that ids allowed. I used to cut my grandmother’s hair back in the day. Personally, I’m leaning towards trying to cut straight across but my hair isn’t really long enough yet. If your hair is long like mrs fw ive seen instructions for making a low ponytail on each side and cutting those off at chosen length. Have not tried this but my hair is long enough if i mess up i just go for the pixie then. Lol. Have also debated the shaved look. That can look good on women, too. My walmart salon has a Tuesday special cut for 12.99. They do a great job there. 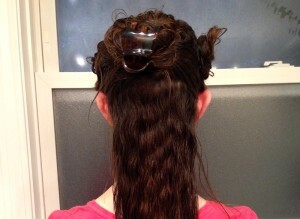 Side note, my daughter’s 39.99 walmart updo for proms was every bit as good as the fancy salon 200 one. Hahah yes, I think sobriety is definitely key! It looks great!!!! Good work, Mr. FW! I’m oddly protective of my hair, and can’t wrap my head around a home cut. That said, I only get my hair cut once or twice a year! Yes to sober hair cutting :)! It definitely took me a long time to get myself to the place of wanting a home haircut–not an overnight process for sure. That’s great that you cut your own hair! I have cut my own hair. It didn’t turn out so great. I had to wear it in a ponytail until it grew out a bit! I have a cousin who went to school for hairdressing. She cuts mine about once a year and I pay her $20. I can’t believe how much some women pay for a cut and color! That sounds like a great deal. Plus, I always like when I can give friends/family business. Ok I’ll amend that you could be drunk just so long as your haircutter is sober ;). But, I hear ya on the Justin Beiber–no one wants to look like that. I felt like we had a pretty big margin of error with how long my hair is, which I realize is not a luxury short-haired people have. Yay for free yoga :)! Nice work! We also cut our own hair. 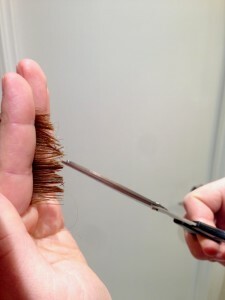 My wife uses a similar technique to you and I secure to the role as back-up in case there is a spot she missed or can’t see 🙂 She cuts my hair and over the past 10 years has gotten pretty good at it! In the beginning…well, it grew back 🙂 Thanks for the post! “it grew back” hahah! We had a few of those episodes early on in my career as Mr. FW’s barber. But, it totally grew back and with practice, his haircuts have drastically improved. 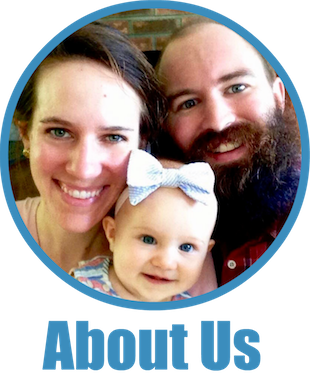 That’s wonderful that you both do home haircuts–it’s such a great savings! Looks great! When you move up into them thar woods, y’all can make extra money cutting your neighbors hair! I cut my own bangs but since I have very fine yet thick, blonde hair that shows every flaw when cut, I leave my main cut to the hairdresser. I go to the Great Clips shop and usually use a coupon, so my once every six months or so hair cut usually costs less than $10.00, tip included. I forgo the extras such as wash, conditioning, etc., which I do at home. I use Alafia’s Everyday Shea Unscented Shampoo and Conditioner, which I get on sale at Whole Foods or other such places. It is about $8.99 each for a huge container that lasts me about six months to a year. If I wanted to color my hair, I would get henna from the health food store or Sally Beauty Supply. Although I prefer a professional to cut my hair, I avoid chi-chi salons, which I think overcharge based on their trendy overblown reputations. .
That’d be a pretty funny add-on to our homestead business: The Frugalwoods Hair Cuttery ;). $10 is a great deal for a haircut–nicely done! Agreed on those fancy salons. The truly FINAL FRONTIER of frugality would be allowing Mr. FW to do home based surgery on you if you needed an appendectomy! Or having your hair cut by having Frugal Hound chew then ends off your locks! LOL! That would definitely be taking things tooooooo far ;). Impressive on all levels! Trust, execution, final product.. 🙂 Great step by step instructions, too — I’m seriously saving this for the future. I’m not brave enough to let the hubs cut my hair yet (but to be fair he won’t let me touch his either!) but I might give this a go when i grow my hair back out. For now I’m happy with it short. After 15+ years of it being about as long as yours, getting it chopped off has been refreshing — although admittedly not frugal as it requires more trips to the salon to keep it shorter. Goblin Gamma, my only boy, also gets his hair buzzed. I used to cut my girls’ hair, but again, short hair is harder. I have offered to attempt cutting hers, but she likes it short, but has VERY thick hair. The pros layer it and usually use a straight razor to get as much of the inner hair out. It’s surprisingly complicated to do, and probably well worth the $40ish we pay a couple times a year. The Wahl #2 is a favorite of home haircutters everywhere I do believe :). It’s hard to mess up (though I did the first few times) and it looks great. FaceCarpet 3000—hahah! Ahh yes, the thinning process is definitely complicated, not sure it’s possible to do that well at home. 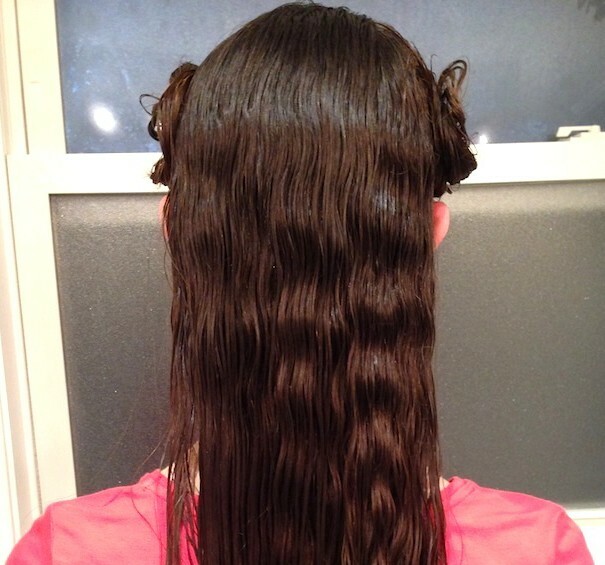 Have you ever tried the Crea Clip for your girls’ hair? It’s supposed to make cutting in a straight line very simple, which I think could work well on shorter hair. Nice job Mr. Frugalwoods! My wife would not allow me to cut her hair and I’m no sure I would want to either, but it would save us some serious cash. Love the sobriety disclaimer. A few summers back I had my aunt who is a former hairdresser cut my hair but it was after a lovely dinner out and few too many glasses of wine. Some how I ended up with one side that was a good 2 -3 inches longer than the other. I actually didn’t notice it for quite a while. I guess that shows how much I pay attention to my hair. The next time I got it cut though I let my boyfriend do it. I figured it couldn’t really end up worse plus I hate the ridiculous hair salon small talk. He’s actually really good at it, which is great because I definitely deserve a few free haircuts for the amount I end up cutting his hair. Oh dear, yes, I think the sobriety clause is an important one :). That’s great that your boyfriend cuts yours–nicely done! Looks great! That can save a lot of money in the long run! I might need to find a friend with some skills. Ever since I stopped growing my hair out and donated it, I’ve needed more regular cuts and have been trying to find a more affordable way. Most places charge an arm and a leg! My wife cuts my hair and has for several years now. At first she was nervous to try it and, truth be told, a few times we just had to cut it all off and let it grow out for a fresh start. But I’ve never been one who’s haircut had to look the same all the time. Now she nails it perfectly every time for the best hair cuts I’ve ever had. Oh, and she uses the dog clippers. That’s wonderful. The first few haircuts I gave Mr. FW were definitely a bit rocky, but over time, my technique has improved and now he says it looks better than the barber. Plus, I’m able to trim up his neck frequently, which makes each haircut last longer. In addition to the savings, I like being able to do these things ourselves. Anything we can learn how to do and then insource for the rest of our lives is ideal in my mind. I like that you wife uses the dog clippers–that’s another level of frugality! The detail, the pictures and the final result! Nice Work! Hubs cuts his own hair (shaved head ftw!) and I go to Fantastic Sams or Great Clips on a coupon maybe twice per year. I don’t think I would let him near my hair right now, even with your excellently detailed instructions. Home cutting seems easiest with long hair or super short hair. I’m smack dab in the middle. For the sake of my marriage, the $20-$25/year to have someone else do it seems like a wise investment. If I let my hair get long again, I may put his skills to the test. Investments in marriage are always a good thing :). And, $25 is pretty good for a cut! My wife cuts my hair and does a better job than the discount salons. She really doesn’t mind it and I appreciate her cutting it because the salons drive me insane as they don’t cut my hair short enough so I end up back every two weeks…not frugal! I haven’t cut her hair and I’m not sure either of us would trust me doing it. She likes her hair cut lady and only goes once every 4-6 months about so it’s an expense that I think is worth it for us. That’s great that she cuts your hair–it’s definitely a good money-saver when you have short hair! And, twice a year seems like a great way to keep costs reasonable. The last time I got my hair cut was when my mom visited us almost a year ago. I think the next time I see her I’ll get her to do it again. I think my husband is too chicken to cut my hair, even though it’s long and straight and I just want a simple straight-across trim. When I had bangs I cut them myself, but I’m worried about not being able to see the back of my head or contort my arms right to cut across the back without messing up. I’ve definitely gotten my hair cut at salons before (most notably the times I’ve cut off ponytails to donate), but I don’t go often enough to build a relationship with any particular stylist and i just find the whole salon experience awkward. I bet you’d do a better job than you think on your husband’s hair. And, if he’s balding, maybe he would consider doing a buzz cut? Mr. FW’s hair is thinning on the top and a buzz is the best way to avoid combover syndrome :). It looks polished without looking like he’s trying to hide the thinning. The bonus is that a buzz is a super easy home haircut! Amazing! I have been persuading my husband to cut my hair for a long time. I will show him your post and give him another push. Like you, I cut my husband’s hair. In addition, I also cut my son’s hair and my daughter’s hair. It saves us tons of money. Now, all l need is to convince my husband to do my hair. While I am cool at cutting other people’s hair, I am a chicken when it comes to my own hair. I cut my husband’s hair but I havr a professional cut mine…in het basement for $15. I wear my hair pretty short and it’s very easy to eff up so I leave it to her! $15 sounds like a pretty good deal! I grew up with my mother cutting my hair on the kitchen stool, but as an adult, I have thin hair that looks stupid unless it is kept short. So I’ve been shelling out $50-60 bucks four times a year for haircuts (sigh). Even cheaper professionals generally do a bad job. I hate this expense but I don’t see a pleasant alternative that allows me to look reasonably kempt. Mr. FP is extremely particular about his hair, so I don’t cut it, either. Maybe over the summer when he isn’t working. He does do the boys’ hair, at least. Shorter hair does seem like it’d be harder to cut at home. 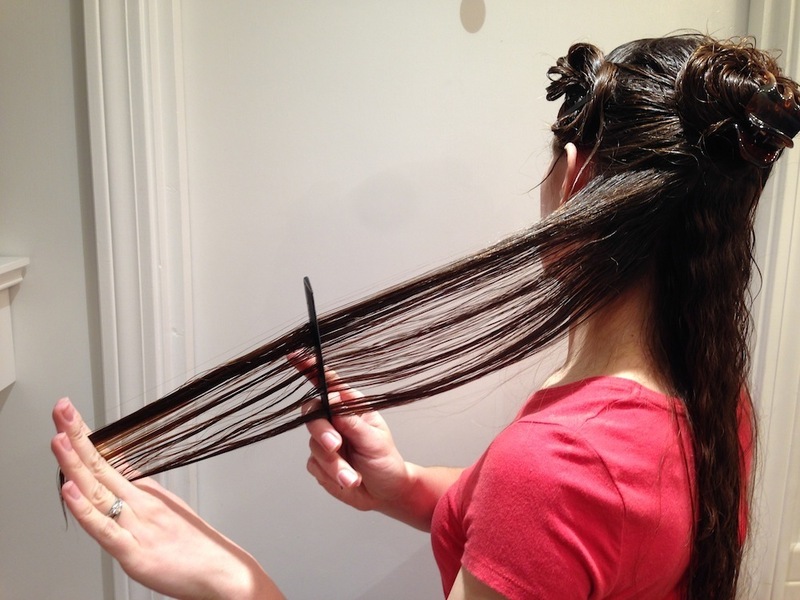 Have you ever tried the Crea Clip? It’s supposed to enable you to cut in a straight line easily, which seems like it might work well on short hair. But, I’ve never tried it. I had been cutting my husband’s hair for years (now he does it himself), but still trekked to the salon for my twice yearly haircuts. After we left to travel, my mother cut my hair a few times. She did a good job, but cut it straight across, which is not too flattering. This past fall, I decided to take the plunge and try to cut my own hair. My husband refused, probably thought he wouldn’t do nearly as good of a job as Mr. Frugalwoods. I figured, the worst thing that happens is that I make an appointment and have it cut professionally if I totally mess it up. It took me a long time – but no longer than getting to the salon, waiting, having my hair washed, cut, and dried, and then returning home. And it really came out awesome. It was a tedious process to make sure things were even but also layered well, but so worth it. Definitely made me feel like I could do so much more for myself. Speaking of, probably time for another haircut soon. This is awesome! I got a haircut in the fall that I don’t love but was $25. I’m seriously considering cutting it again myself though, since I think I could do just as good a job as the hair dresser I went to. There’s a lot of tutorials & youtube videos I found online that make it seem easy but I’m also worried that my medium-length hair will show more mess ups than longer hair. 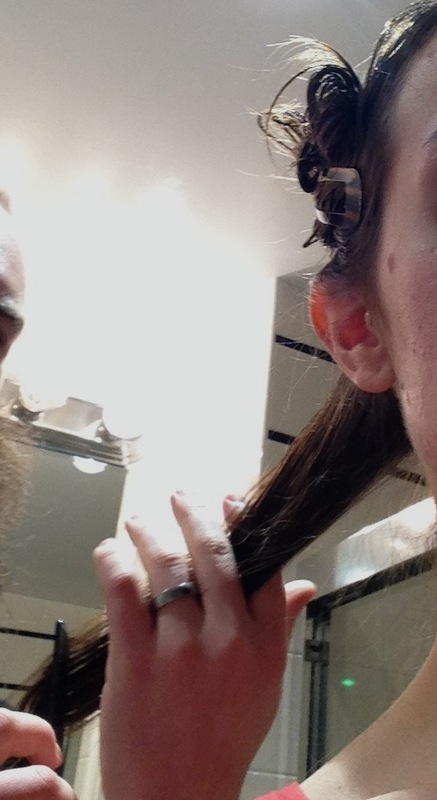 I have been after Dad to try to cut my hair for a few years – he won’t even take the chance. And after my first attempt at cutting Daughter Person’s hair, I’m not allowed to touch his or hers again. I’ve considered trying to cut my own, but I have the medium-ish bob look, and I can’t reach the length of hair I want 🙁 Luckily – my mom is willing to try – seriously, I just want it cut straight across at a certain length – and I’m not even that picky on it being super even. As long as I can continue to pull it back into a pony tail, it’s acceptable! That’s great that your mom is willing to give it a try! 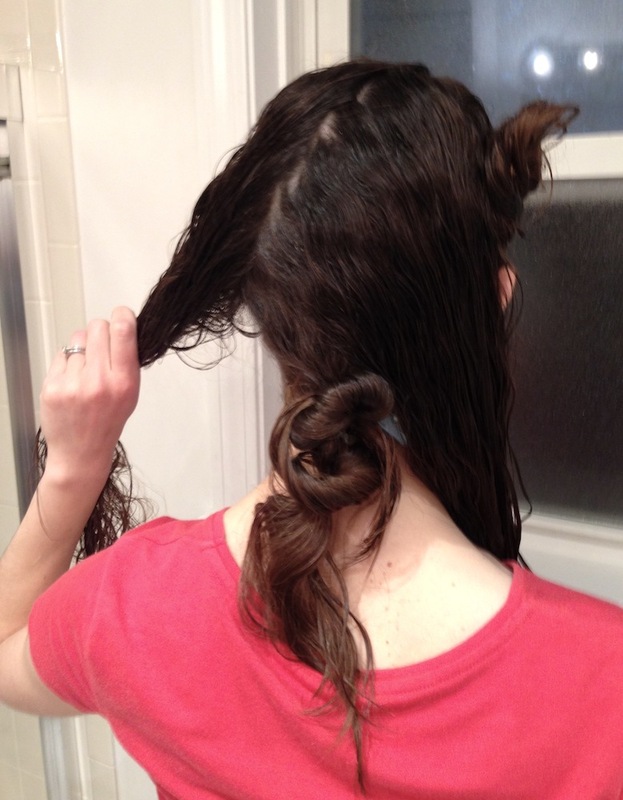 And, you could try the ponytail cutting method to ensure it’ll still be able to be pulled back. Applause! We always cut our hair at home — my spouse keeps his head shaved, and he cuts my hair maybe once every 3 or 4 months — so I am super familiar with this one. SO worth it versus the hassle, time, and money of the salon. I generally divide my head into quadrants and have him cut the bottom two an inch or so shorter than the top two, for a really simple layered shoulder-length cut. I also find that matching lengths on either side of the face makes the cut look more professional. I have thin, fine hair and am now happy with a really short cut which makes it look thicker and have more body – very short at the back, ears cut out. When it was long it always looked lank and lifeless, and I wasted time putting it up. Unfortunately that does mean a haircut every 8 weeks – and that’s really pushing it, it looks really different each end of the 8 weeks. But I’m pretty happy, it saves me a lot of time every day styling. Plus I only pay £20 a time – tried loads of hairdressers after moving here by buying Groupon deals for different salons and trying them all on the cheap til I found one I liked. (Most of the Groupon deals would have been £40-60 for a cut, conditioner and blow dry. I only get a wet cut, at the hairdresser’s suggestion, as it dries whilst being cut and I don’t really like the blow dried look anyway. 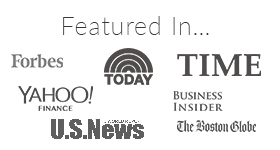 That’s great that you found an inexpensive hairdresser–definitely beats paying top price! What beautiful and soft hair you have Mrs FW!! I am of the thick-hair type. I realized you just had your ends trimmed in length, have you and Mr. FW tried figuring how to cut the hair so it will appear less thick? Ever since I was a kid, every salon (and every hairdresser) would tell me to look at the floor (see how much hair we’ve snipped! much more than a regular person indeed). Each time I go to the salon and would tell the guy “hey please make it less thick” and off they went to snip the layers, if I just ask them to trim length-wise I might probably be the woman version of Hagrid in Harry Potter……lol is there a Part 2 for this series? Many thanks! My hair is very thick, but I actually haven’t been getting it thinned in recent years. I’ve found that the long length helps to weigh it down and sort of eliminates the need to thin it out. I definitely do not know how to do at-home thinning, but I bet someone on the internet does… you’ll have to let me know if you find a good guide for it! The first rule is a good one. I had a hair appointment last week, and my hairdresser had fit in a last-minute booking ahead of me, to rescue someone who had tried to cut her own hair post-breakup-post-a few drinks. Nice! I do agree that since your hair is long and thick you have some room to work. I would have considered letting my husband cut my hair when it was long, but I recently hacked it all off and therefore it needs professional attention. I don’t go often though, so that saves us some cash. I did have my husband dye my hair once very early on in our relationship. He did a surprisingly good job. Since I don’t color my hair anymore I no longer require his services. Yeah, we absolutely had a good margin of error with the length of my hair. I can see how it’d be more stressful to cut short hair at home! 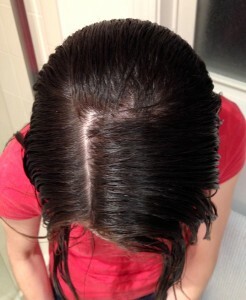 Way to go on not coloring your hair anymore! That’s an awesome way to save. I wasn’t brave enough for a long time, but I finally got to a place where I felt like it was worth a try. And, I’m glad we gave it a shot! Your hubby is my hero! I am not as brave as you are partly because my husband’s hands shake like a leaf. However, I do get my niece, who works for a very high end salon and spa, to color and cut my hair for a deeply discounted price. I wear very little make up but I indulge on a couple of spritz of a nice perfume, for some reason it makes me feel alive and pretty. Hahaha, he’s my hero too :)! That’s great that your niece cuts it for a discount. Great deal for you and nice to be able to give her the business. I’m always glad when we can send business to friends/family. I have not ever cut my own hair but the hubby is interested in saving allowance money by having me cut his hair. I better learn how to do that! 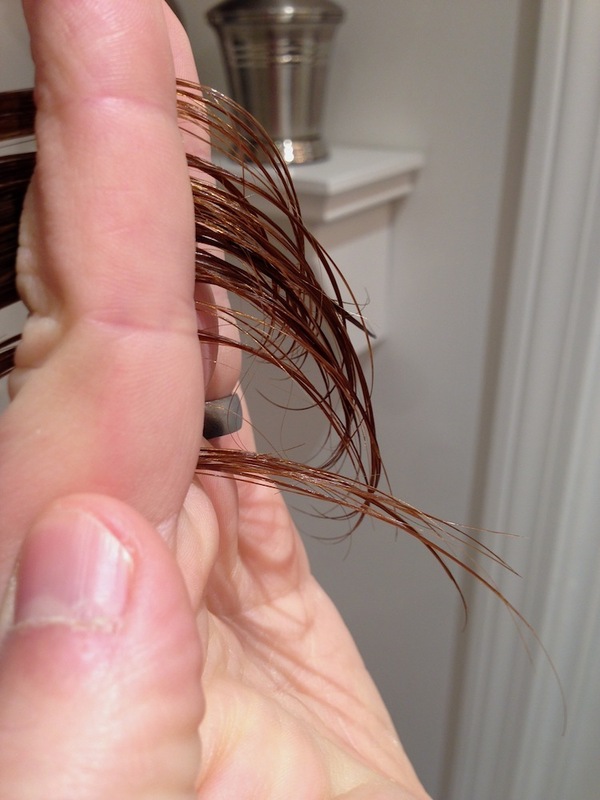 I did try to cut my daughter’s bangs when she was a toddler and it didn’t turn out so great. We do have an awesome gal that comes to our house to cut our hair and has a good rate! I don’t think I would ever pay $120 for a haircut. Menfolk hair isn’t too tough, once you get the hang of it. I’m sure you’ll do great! Accolades to you both! I used to be able to cut my own hair when it was longer but now that it is chin length trying to get the back correct is a challenge. The husband tried once but after a few tense exchanges we decided it would be best if he didn’t try again. I limp along and only once a year go in for a “custom” cut. Works for me. Good enough. 😀 Happy frugaling to all of you. Keeping the peace in the marriage is definitely worth the cost of a haircut ;). Happy frugaling to you too! Last year I went to the salon twice for a shampoo, cut and style and only paid $15. I always give “my girl” a $5 tip. The salon slightly raised their prices this year to $18, but that’s still an incredibly inexpensive price to pay for a trip to the salon!!! I did have a former BF cut my hair one time and he was more nervous than I was. He did a great job, though!!! Sounds like a very reasonable salon price–nicely done! And, that’s awesome that you got a home haircut–once you get past the nerves, it’s not really all that difficult :). And great job on the frugal haircut. I don’t think I’d feel comfortable enough to cut my own hair, so I’m stuck paying €16 every six weeks for a haircut. I’m happy that I’ve found a decent but cheap salon, because I know a lot of my friends – especially girls – can easily spend over €40 to €50 every time they go in. Why thank you! I can understand not wanting to cut your own short hair–I’d think that’d be pretty tough (especially to get the back of the neck even). I just found your blog a few weeks ago and absolutely love it…. even more so now! I had been in need of serious cut and color (prematurely gray!) but not only do I hate paying for the salon, I just hate how long it takes. Anyways, I am very happy to report that after your reading your post, my husband not only just cut, but also colored my hair for me! And it turned it turned out great (full disclaimer: I have long, thick and wavy hair too, so very forgiving). Great way to pass a snowy Sunday and we saved a bundled. I will say that we didn’t follow your instructions to the T though – I was so nervous I had to have a glass of wine (or two) during this adventure! Thanks for the inspiration and for saving us some serious cash! Pretty awesome that it’s only just February and Mr. FW has already wrapped up husband of the year. The talent of you two. Geez…..it’s really not fair to the rest of us. Mr FW did a great job. I rarely cut or trim my hair and I doubt if I would let a family member do it. I have a colleague whose husband has been cutting her hair for the past year and he always does a great job better than the professional hairdressers. A standing ovation for your husband! He did a great job! Awesome! I just recently started cutting my own hair. My typical hair cut costs $10-12 before tip (I’m a guy). The clippers I bought were $25. I’ve cut my own hair twice now, so I’ve more or less broke even at this point. Cutting hair in the back is quite difficult! I stand with my back to the mirror, and use a handheld mirror to look at the big mirror. But what I got wrong the first time I cut my hair was the way to hold the clippers – if you don’t hold it right, you can block your line of sight to the mirror! 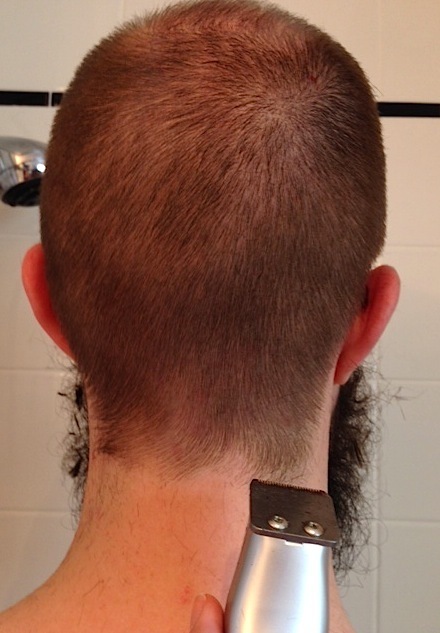 One of my friends is pretty good at cutting his own hair though, so he taught me how to hold my clippers properly. My first self haircut was pretty bad. My current one is actually not that bad. My friend who cuts his own hair says if he looks closely he can tell it’s uneven in the back, but if you don’t look closely it’s not noticeable. Good enough for me! I’m impressed you’re able to cut your own hair! Sounds like a serious skill! I cut Mr. FW’s for him and that’s hard enough for me :). Rock on with your home haircuts! I scrolled down too quickly at first and saw just the first two photos and thought you had shaved your head. I was like, WHOA she is really taking this anti-vanity project very seriously indeed. Then I realized that was not your head. Mr. FW did a great job! Haha–that’d be intense :)! Definitely an easier haircut though…. Haha I’m working on it! The problem is I need practice, and I only cut my hair once every 8 weeks or so. So it’ll be years before I can say I’m good at it =P. I’ve been cutting my own hair for a couple of years now. Since I usually wear it in a ponytail it’s easy for me to use the Ponytail Holder Method (wrap a ponytail holder just above what hair you want to cut and snip away!). Mr. Mandalay gets his hair cut for eight bucks by a local barber who wears the SHARPEST. SUITS. EVER. Nicely done on cutting your own hair, I’m impressed! $8 is a great deal for a haircut–Mr. FW’s barber charged $20 before we transitioned over to the home clippers method a few years ago. That was an AMAZING job he did! Jay used to cut my hair when it was long, but it was not as fancy as that! It was more of a “take small snips at a time and angle it, not straight across” kind of thing. I’m impressed and will make him read it too, because it’s getting long again and I don’t want to do it myself or go to a salon. Congrats on a fabulous cut! Thank you so much :)! I hope it works out well for you and Jay too–Mr. FW found it pretty easy once he got the hang of it. I cracked up when reading this!! Also, you’re hair is SO healthy! He did a great job. The last time I went somewhere for a haircut was when I donated it… other than that my husband cuts it every 6 months or a year and if he does any fussing with layers or anything other than long and straight I get downright fussy… my standard work look is hair in a ponytail, since that keeps it out of the way (I’m an OB/GYN and amniotic fluid in hair is DISGUSTING… and that isn’t the worst thing I have gotten on myself at work). Looks good! When my oldest son needed his first haircut I took him to a salon and his cried until he turned purple. It was awful. I watched the technician and pretty much duplicated it for him for the next twenty years. I also cut my youngest son’s hair, but his was a courser texture so I stopped when he wanted a more challenging hairstyle when he was nine. I saved a ton of money and aggravation over the years. I have also trimmed my hair, mostly the front and my husband’s neck in between cuts. I’ve also had my MIL highlight my hair. She did a great job! Good for you and hubby trying this! That’s great you were able to cut your son’s hair for so many years! Think of all the money saved :)!! Mrs. FW, do you color your hair? If so, any advice on that? Hi FrugalCat, I don’t color my hair. It’s just its natural hue. Sorry I can’t help! Okay. I’ve done this for the third time (not the exact style of yours, but similar–with bangs (eek!) and layers. I’m thrilled to announce–drumroll please–that I’m happier with this haircut than I’ve ever been with any from Great Clips (which I used to do because it was cheap) and equally happy with this haircut as I was with the more pricey salon my friend referred me to ($40/cut + trip, glass of wine included). Actually, though, I’m not out the money, so I think I’m just a bit happier than that :-). Thank you for the tutorial and tips! The triangle cuts for softened edges are GENIUS and me not knowing about that tip is likely why I never liked my past attempts. Yay! That’s awesome! SO happy to hear it worked well for you! Mr. FW gave me another haircut on Saturday and I love it :). I doubt I’ll ever go to a salon again! A repeat performance of getting a great haircut at home, congratulations. I have been salon-free for a number of years now, it is a great feeling. My guy trims my hair every other month and he does the fully detailed method of sectioning it, and trimming the ends, letting down the hair in 1/2″ sections, not just the straight across the back cut. It gets the split ends that wouldn’t get trimmed otherwise so my hair doesn’t thin out. I was paying $55 including tip and 15 mile each way to the salon and I was never really happy with the results. So I estimate that I have been saving over $400 a year and getting better results. I do my two children’s hair at home, started after two bad haircuts at the barbershop. So adding in their monthly haircuts and transportation costs, I am keeping over $900 in my budget for other necessities like food, gas, clothes, etc. I am also concerned about the chemicals in the hair color as well as not frying it or spending insane amounts at the salon for coloring. So I bought henna and told my guy that he is my stylist, so he can add colorist to his resume. It took two packets being my hair is long like yours. He reviewed YouTube videos before the event so he was prepared. Net result was that it was a little messy, but the color came out great and my hair feels so soft. A woman who owns a salon complimented me on the color and asked where I had it done. She was surprised when I told her my guy did it for me. She said he did a fabulous job and she would hire him if he had a license. So the at home color to cover my grays is saving me hundreds more a year and I get results that get compliments. I would call that a success. Nicely done, Cheryl! I am impressed! We were actually just talking last weekend about how much time we save by cutting at home. Takes us about 10 minutes versus the schlep to the salon, waiting around, etc. So much better to just DIY–it’s really a lifelong exercise in saving money. We’re always going to need haircuts, so by insourcing we’re saving money for the rest of our lives. I think it’s awesome you do your kids’ hair too! I love the term “in sourcing”. Just gave both children haircuts outside, took about 20 minutes plus clean up with the leaf blower. Both received great haircuts and I am smiling knowing that saved me $50 plus the two hours the monthly task would take if I had continued to outsource it. My coworker wanted to see pics of the finished haircuts, so I texted them to her and I stated this was the finished product of my in sourced haircuts 🙂 assuming I give them haircuts at home until they graduate high school, I calculate that it will save me over $12,000. Now if I could bank that money rather than spend it on other things, it would certainly pay for a very nice used car. That’s awesome! Love it :)! Ok, I’m really REALLY nervous about this. Like, embarrassingly to the point where I’m almost in tears. Talk me into it? almost to tears? How long is your hair and how often do you have it done? For your first at home cut, don’t try anything drastic, just small trims to build confidence. Make sure your guy understands exactly what you want, and doesn’t think it would be fun to take off several inches when you want a quarter inch trim. Watch a number of you tube videos with your guy and then get the required tools and supplies to do it right. Sharp hair shears are a must. And plan to do the haircut when you have plenty of time. Don’t do it twenty minutes before you have to head out the door. Update! I was too scared to have my husband cut my hair for me but not too scared to do it myself. I found an awesome online tutorial and am now calling my haircut “The Unicorn” both because you pull your hair into a forehead ponytail to cut it and because it came out so magical! Thanks for building my confidence. I will NEVER spend $$ for a haircut ever again! Wow congratulations are in order Joan 🙂 I am glad you had success with the ponytail on top of the head cut. Not everyone does. I had a friend that tried it and was unhappy because she had too short layers she could not pull back in a ponytail and it made her updos and braids look ratty with shorter pieces sticking out. 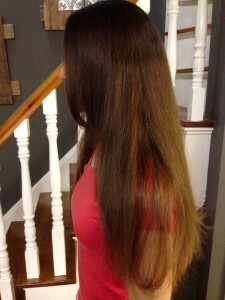 It took her over a year to get her ends evened out again. I just got my hair trimmed this weekend. I had my guy do it. He poured me a glass of wine, caped me, sectioned and pinned up my hair before he gave me an awesome trim. I have him blunt cut the ends so they are full to look great when I wear my hair in updos and braids. I really love having my hair braided, so layers would not work well for how I want my hair. Knowing how you want your guy to do your hair and communicating that is important to have a happy result. I get this personal service roughly every other month. He has never given me a bad haircut and I had far more than my share before I stopped going to the salon. And yes it is awesome to know you never have to spend $$ to have someone give you a haircut you don’t like. I also have my guy do my color with henna, color and shine are awesome and the henna leaves my hair really soft. So I figure the insourcing of my hair care saves me a good $1000 a year with great results. And thankfully I have a guy that is patient with me and does my hair for me EXACTLY as I ask. Again congratulations in taking that step and being in control of getting your hair as you want it, not as someone else decided for you, and at a great price. Do remember to keep your shears sharp. You can use the Crea clip as a guide. I stopped going to the salon because it takes up too much time and the hairdressers never listen anyway. So, now I used the Crea clip (costs less than $30) and I am able to trim my hair more often so it’s healthier and it always looks good. There are plenty of similar hair tools available–I’ve seen them for as little as ten bucks. I used to spend $40 to $100 on haircuts and I can now use those dollars to purchase healthy food—-always a good investment. Man, I want to try this out so badly. I just tried to trim my hair at home using the dreaded “ponytail” method and it didn’t go in my favor. I ended up having to spend $8 at a salon to get it fixed. $8 isn’t a lot of money, but I would have preferred to not spend it! I brought this up with my fiance the other day, and he agreed to try cutting my hair (though we are definitely waiting until after the wedding, which is September 18)! So instead my solution is to get a haircut every 2 years or so. I cut it super duper short (the instruction is always “too short to go in a ponytail holder or headband”) and then let it grow out until the headaches from the buns get real bad. It seems to be a reasonable compromise to keeping my hair looking decent for work and not spending a ton of money. I’m lucky I don’t get split ends so I don’t need “trims”. I didn’t read all of the comments and perhaps someone said this but…. I pull my hair to the top of my head like this. It works GREAT! and is done in a couple of minutes. https://www.youtube.com/watch?v=brmQhv6Uw1g&ab_channel=diy_solutions If you want an even trim – just pull to the very top of your head. Haircut time would be the only time that we’d let him have a lollipop. That kept him less fidgety. And yes, you need a cup of water to rinse the occasional hair off the lollipop. We’ve even done the hair cut in the tub – less clean up. My son as a teen actually buzzed his own head – his idea. We clip our own dog. My granddaughter has been cutting my hair since she was 9 years old! She is now 13! She learned by watching the beauticians cut her mom’s hair! She’s really good at it, too! I have rather long hair, but it still needs to be trimmed, so every Christmas, I get a gift certificate from my granddaughter, and she trims about 4-5″ off of my hair! That’s it! I never color my hair, or do anything else to it! I am 76, and have very healthy hair! I just wash it, and let it air dry! I have cut my hair several times in different styles – added fringes to my long hair in high school, cut from under-my-chin length bob style to short and did pixie as well along with my regular trimming of my fringes. When the pixie started growing, I went to my hairdresser who shaped it for me (and she never ever commented “who the h*ck did this butchering to your head” so I take I did a good job, and also people complimented on my own cuttings a lot). I always operated on the philosophy that “you can keep correcting it until you are bald so nothing to be afraid of” and that helped me tremendously on the confindence side eliminating too much overthinking. What’s the worst that can happen?! That it turns out so bad you need to go to the hairdresser. But you had that cost in your budget before so in all equation, you come out not saving that money but spending as you did in the past. But no extra cost. If you see what I mean. Youtube is full of haircutting tutorials I found out lately where you can watch hairdressers cutting their own hair and explaining what they do. Plus, I always pay attention to my hairdresser’s move and try to mimic them at home (she does a thing to thin my hair at the front and top that I love because I have loads of thick hair, too and it gives me a soft outcome). I found two great pairs of sciccors in Poundland (UK version of Dollar Store), one is a regular pair, the other is used to thinning with one blade having comb-like… well whatever. They are sharp, easy to use and cost me only £1. Thanks! 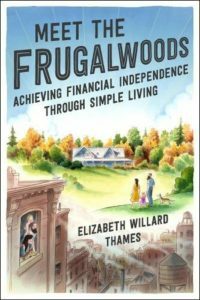 Last night I thought, if Frugalwoods can do it, so can I! Today I cut my own hair and it was really straightforward. Much more satisfying than paying for it, and I’ve finally got the cut I actually want. It was easy and turned out exactly as shown in the video. The video uses a “guide” which meant it all matched up properly at each point. It was a no stress self haircut. Self expression was a meaningful bonus from a free haircut. Bold Mrs FW, but I do always have the mindset that it grows back. I’ll admit I’m guilty of LOVING my hair cut. My salon days make me feel pampered and well cared for. I’m a nurse; I work long hours caring for others and usually am wiped by the end of the day. Scrubs are great because they provide all comfort all the time but you do feel a bit frumpy sometimes. I don’t wear makeup and my hair usually just goes up in a clip. But my 45 minutes in the chair, having my head rubbed and scrubbed it’s amazing. My salon serves wine too so that helps. Whoa- I know what you’re thinking “she must spend a fortune!” I don’t! 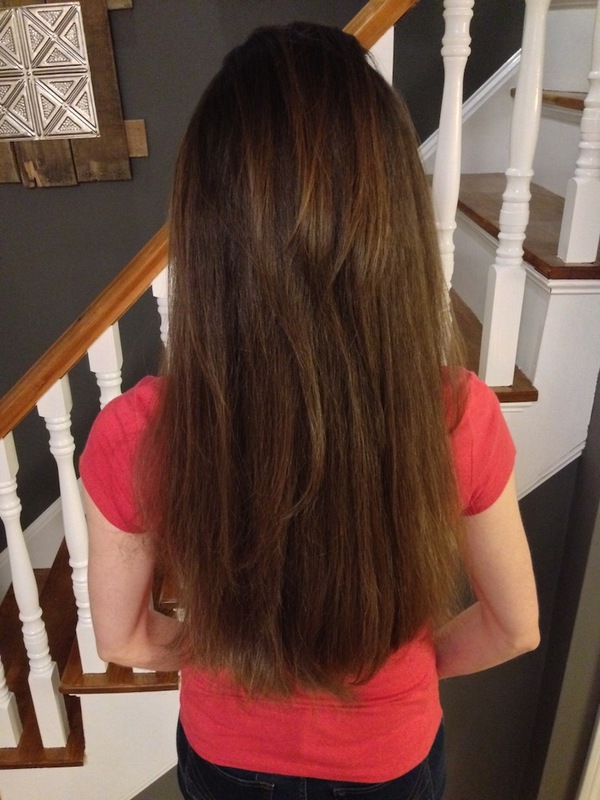 So here’s my secret- I get my hair cut maybe twice a year, I grow it super long, hack off 8 inches to donate to Pantene beautiful lengths and my hairdresser gives me a steep discount for my generosity. Maybe it’s not the perfect frugal hack but it is a nice compromise to paying top dollar ever 8 weeks for something that no one really looks at. Happy saving! About 18 years ago I was a uniformed officer inside a main post office. The Kevlar vest was a misery in the humid South so I kept my head shaved. One day while shaving the old noodle, I decided to have some fun with the boss. I left a hockey puck sized body of hair on the back of my head. The boss immediately questioned what was going on. I explained I intended to let it grow until it reached my collar. He reminded me it wasn’t permitted to touch my collar. I told him I was planning on weaving it into a sort of pig tail and using gel to hold it up off my collar. Of course he lost his mind, which was the whole intent. I kept shaving around the hair puck for about a month just to keep him antsy. The most unusual thing was customers, (i.e. strangers) would walk up behind me and start running their fingers through the hair while asking me why it was like that. After awhile it didn’t startle me and I stood with my back to the wall way more. After a few months I relented and shaved my entire head again. Was quite a learning experience in many ways. Love this! Growing up, I don’t remember getting many haircuts because they are expensive. My parents had ten kids (five girls and five boys) together and you can imagine how something simple, like haircuts for school pictures was a hardship. The last professional haircut I received was in sixth grade. After that, money was tighter and I learned to cut mine myself too. It was all trial and error for me. I’m 23 now and still use this method. Gather all hair into a sleek HIGH ponytail. Depending on where your ponytails sits, will determine your layers. I put mine very close to my forehead as to keep more length and add more layers. I make one cut straight across the end on the ponytail and done! 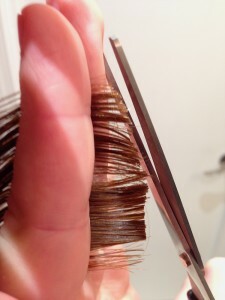 I usually point cut the ends or use thinning shears because my hair is very thick. My coworker says that is how she learned to cut hair in beauty school, at least the same concept. I get asked pretty frequently if my hair is a wig (maybe because there is a lot of it..?) and who my hair dresser is. Holla! This work ladies. I have never, ever spent money on a haircut in my entire adult life and don’t plan on it anytime soon.